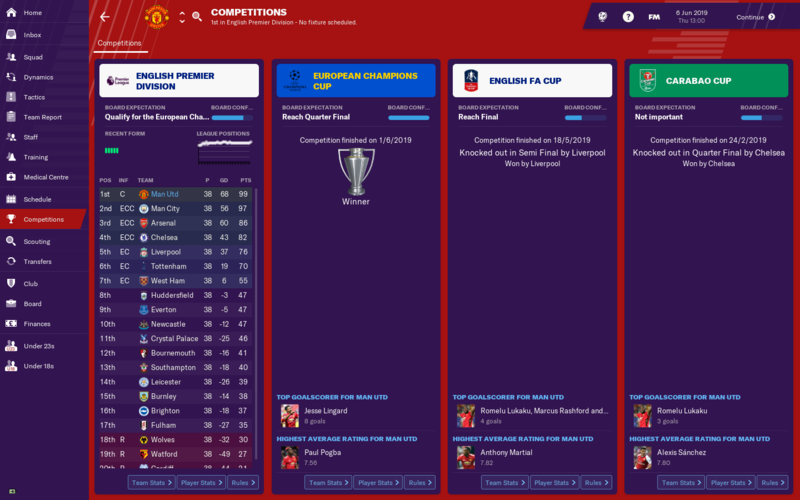 What a first season! 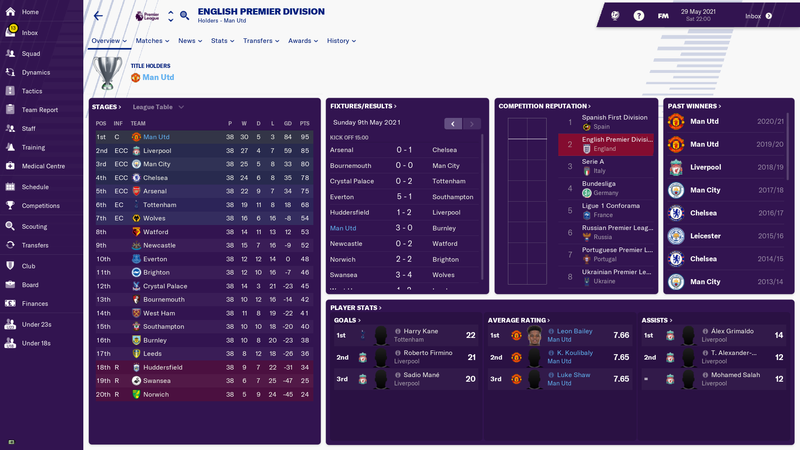 I don't think I've had a first season like this in any save on any version of FM. I started playing 4-1-2-3 and 4-2-3-1 and, whilst we did ok, neither Lukaku or Rashford were scoring much as a lone striker. 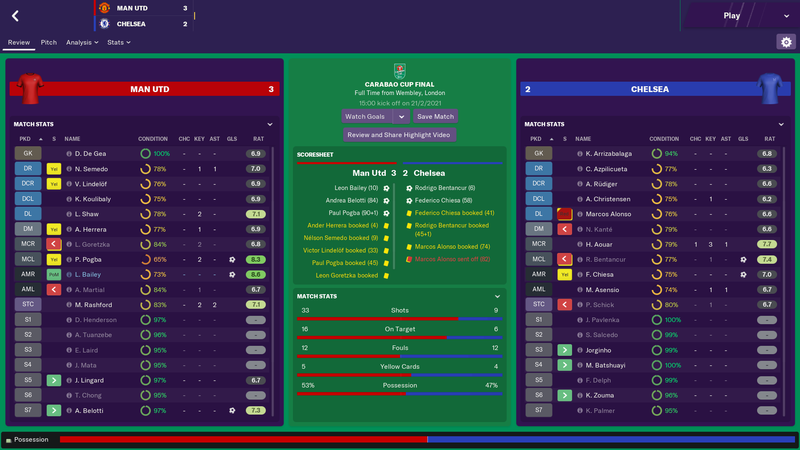 I switched to more of a 4-4-2 and suddenly Romelu and Marcus were on fire. 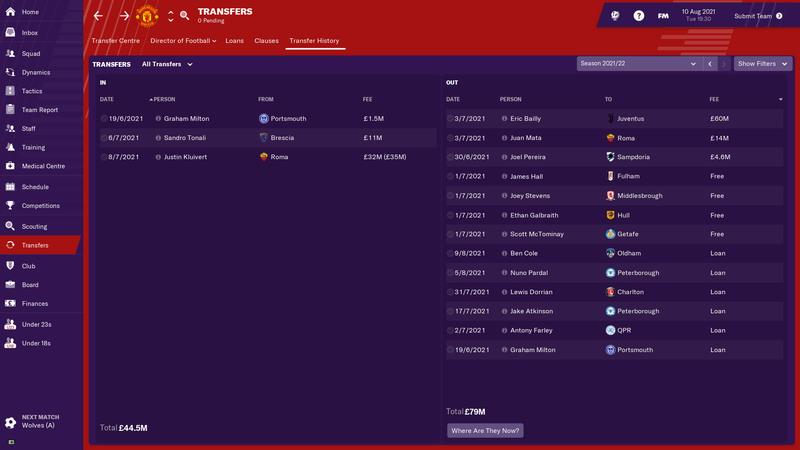 I only signed Tierney in the January transfer window. Before that Shaw was my LB and after Tierney arrived I rotated them, with Tierney being my big game player. Martial rotated up front as well, Sanchez rotated wide left, and Mata rotated wide right as an AP. I gave Hughes playing time in the Pogba role and Fred playing time instead of Fellaini. Herrera figured early season in the Fellaini role but, after a longish injury, never got back into my thoughts. Lindelof was my back-up at RB and CD. But I'm not sure about our finances. Got this guy on my first youth intake. Progressing quite well so far, hope he can develop into our next number 1. 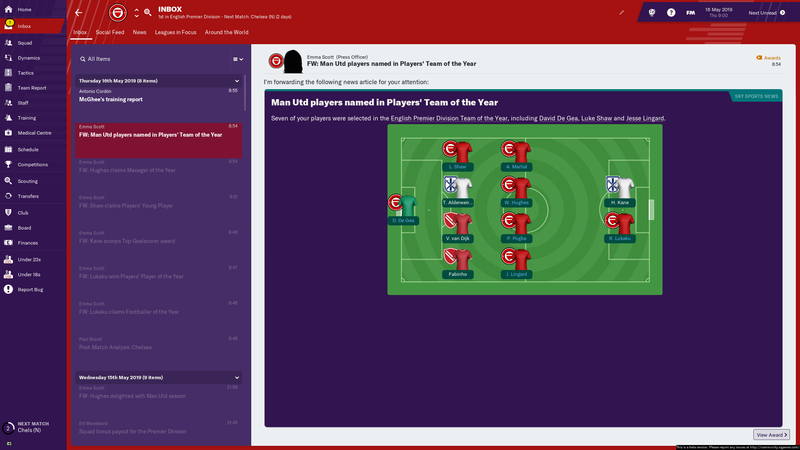 I also use Pogba as a Mezzala in a 3 and he has scored over 25 goals in both season and won the world player of the year. He's been immense. Fair enough, imo you can't really tell with the big ME issues, I feel the roles don't do what they sometimes and it hinders the playing styles. IF's are ishy for me especially martial but does great at assisting. I've literally just gone back to 17 and tried buying players from 19. Savic and a couple others look incredible. Maybe the wrong place. 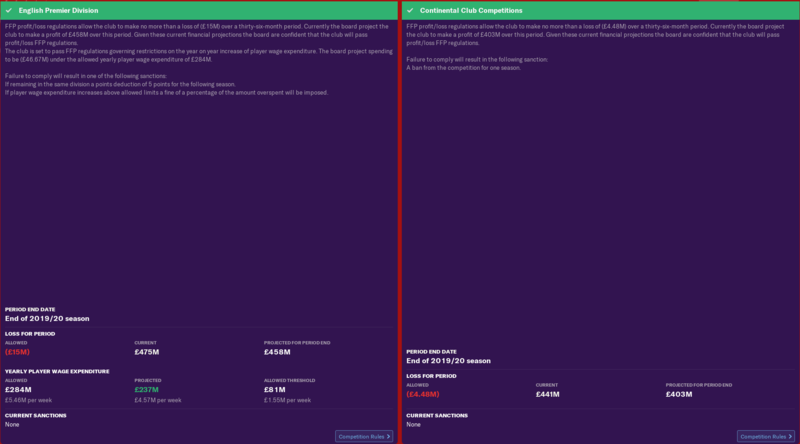 I haven't played FM19 since the month after it's release and have uninstalled and am currently in a refund battle. Just curious whether there has been an update? I've noticed there previously was one, which by the looks of the bugs forum, have made things much worse. So yeah, has there been an update, or are they stalling for FM20 to release more nonsense? If not, I've lost faith in FM. Wrong place. There have been two updates - go to General Discussion and they’re pinned threads at the top, or at least the most recent one is. First one made it better - long shots perhaps slightly OP but one of the most balanced ME I’ve played. 2nd one ruined it if you’re a Mac user, hopefully they patch it quick. Just finished my first season with United, and I'm very pleased with how things went! 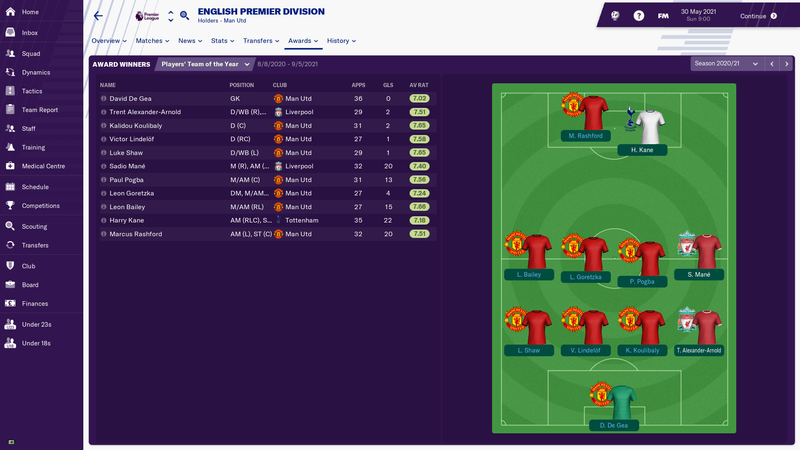 OGS taking over inspired me to jump on FM and get United playing 'The United Way', and that's exactly what we did. 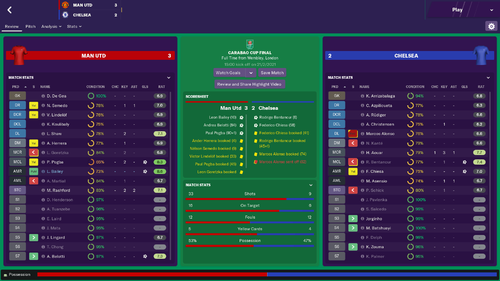 This was THE most intense title race I've ever experienced on Football Manager. City pushed us all the way and were actually ahead by 1 point up until the final day. We took care of business and beat Wolves comfortably 3-0, whilst City lost at home to LIVERPOOL (of all teams) 2-1 at the Etihad. Can't say I wasn't fearing another infamous Aguero moment, but fortunately, that never came. This was my starting XI when everyone was fit and available. Sanchez was an absolute monster on the right, and Martial was equally good on the left albeit a tad inconsistent. Lukaku bullied the smaller teams, but struggled in the big games, especially when we were playing on the counter, but 25 goals in 38 league games is a good return so can't really complain. The whole team back to front was just solid, only conceding 15 goals in the league - Smalling deserves an honourable mention, never had a bad game whenever he was called upon. City had their chance to gain revenge in the CL Final, but we were one step ahead once again, beating them 2-0 AET. Going out to Liverpool in the FA Cup was really disappointing. We had so many chances, especially Lukaku, but we just couldn't put them away whilst Liverpool scored from two indirect FK's! So in my 1st 2 seasons were decent we won 1 trophy in each season, which I've shared earlier in this thread, so we had done ok but not amazing. But season 3 has been incredible. 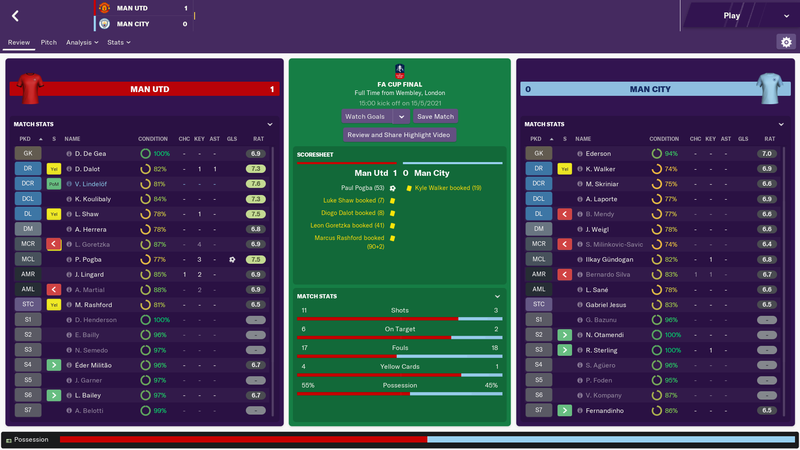 We started it off by winning the carabao cup in a thrilling final against Chelsea. Alonso's red card sparked a comeback and a last minute winner. We then retained our premier league title with ease. We were pretty dominant, scoring 103 goals and only conceding 19 goals. Some highlights was beating Liverpool 6-0, recording our biggest victory beating Swansea 9-1 and ending an awful record against Man city beating them 3-0 at old Trafford. De Gea won the golden glove with 25 clean sheets. Leon Bailey won the footballer, players player and young player of the year. Rashford was 2 goals away from being top goal scorer, which was a shame he missed out on but he had a great season leading the line. As you can see we had 8 players in the team of the year as well. We the followed that up with trophy number 3 beating our bitter rivals Man city in the fa cup final. 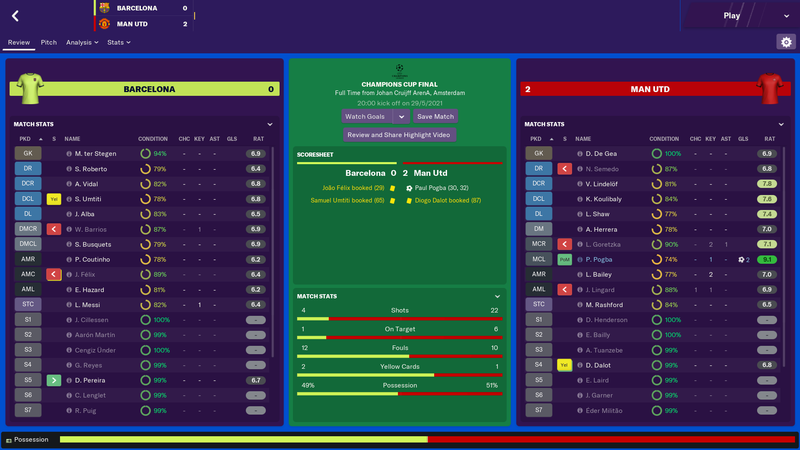 Was a tense final of not many chances but we got over the line thanks to Pogba. We finished the season in style clinching trophy number 4 and a clean sweep winning the big one, the champions league, beating Barca, in a game we completely controlled and they didn't get a sniff. Rashford was the top goal scorer in the champs league. As you can see as well Pogba was the man in the finals scoring in all 3 finals. 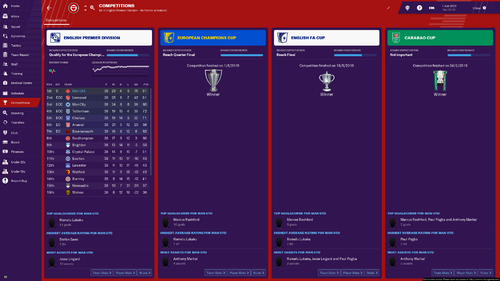 In winning all 4 trophies, we only lost 3 games all season and they were all in the league, it's probably be the best season I have ever had on fm, from what I can remember. Here is the season 3 stats for all comps. 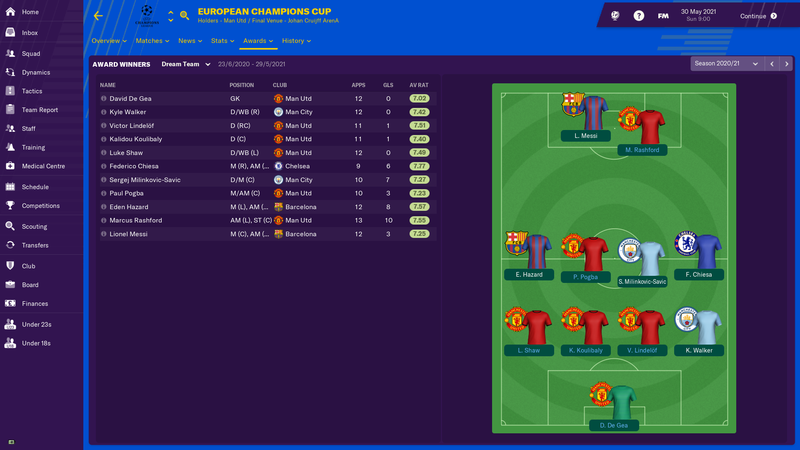 Rashford, Bailey and Pogba were my 3 best players, Rashford was incredible and as I said Pogba was the man in the finals. De Gea got 37 clean sheets in 55 games, and with Lindelöf and Koulibaly's partnership just getting stronger they were formidable in our success, and formed an unstoppable spine of the team. A player you can't see in the stats is Semedo, he didn't score a goal but got 11 assists in all comps and buying him for 12 mil in the 2nd season has to be one of my best buys. I'm not entirely sure what I want to do transfer wise, but Bailly is going to Juve for 60mil and Mata possibly may go as well. A couple more youngsters will come up. 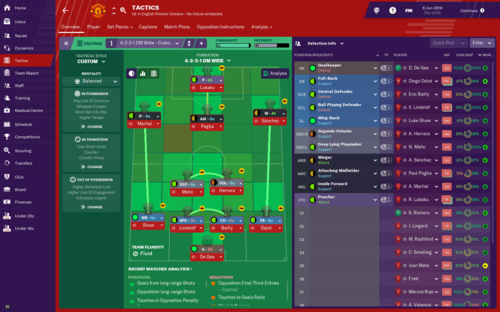 Greenwood is one, Angel Gomes will be in the 1st team after a couple seasons out on loan, plus I have 3-4 regens that I've got over the 3 youth intakes I want get in. 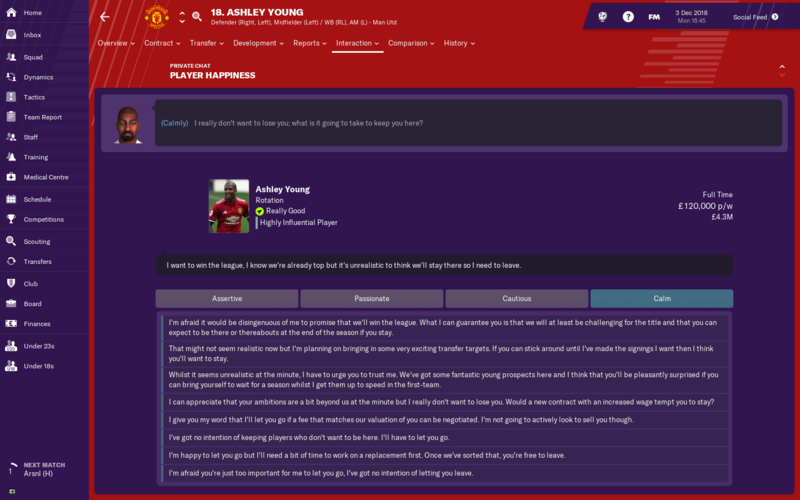 Great so I've just had Pogba come to me wanting a new contract, to which I say yes to.I go to offer the contract but his agent says he doesn't want to renew until after the Euro's. 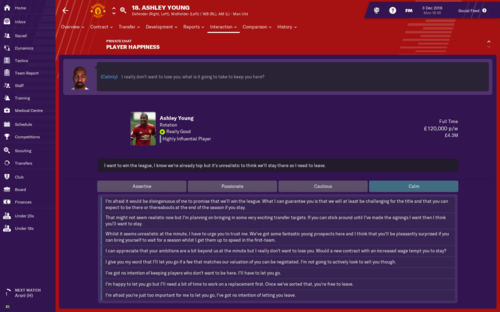 The catch is Pogba has now come to me to complain because I went back on my promise to offer him his new contract. Now he wants to leave the club.Bloody brilliant. 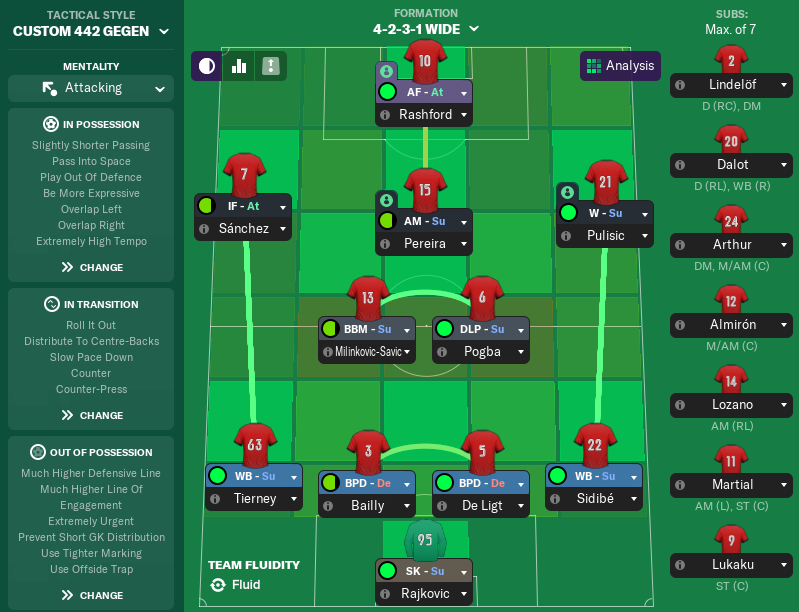 Start of season four and I want to play gegenpress 4-2-3-1 but in bigger match that I play away I want something more caution. Maybe control possession or fluid counter attack? I ask now because first 3 season I try to play on my own tactics not some default tactics . 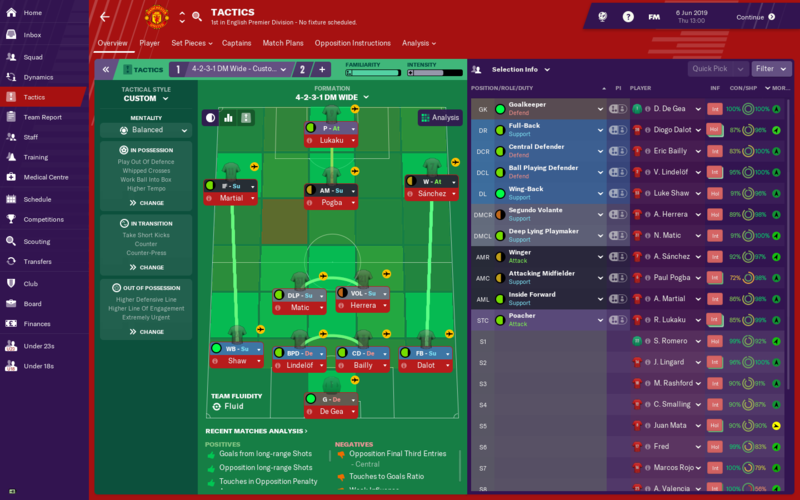 Question Man U players, How do you rate Marcos Rojo, looking at him as a potential loan recruit for my Real Sociedad save (if Man u agree to subsidize a good part of his wages). Keep him as a backup and sell him on after a season or 2 unless a bid comes in OR rotate him to increase hill value to sell him. He's not great but he'll put in a shift when needed but his ability is below that of smalling and jones. So he'd be a decent enough option for a season long loan while I wait on Diego Llorente's leg to repair itself. Yeah. Just watch him if he's on a yellow, he has a competitive streak. cheers, It's between him, Mangala or Britos as the experienced defenders. 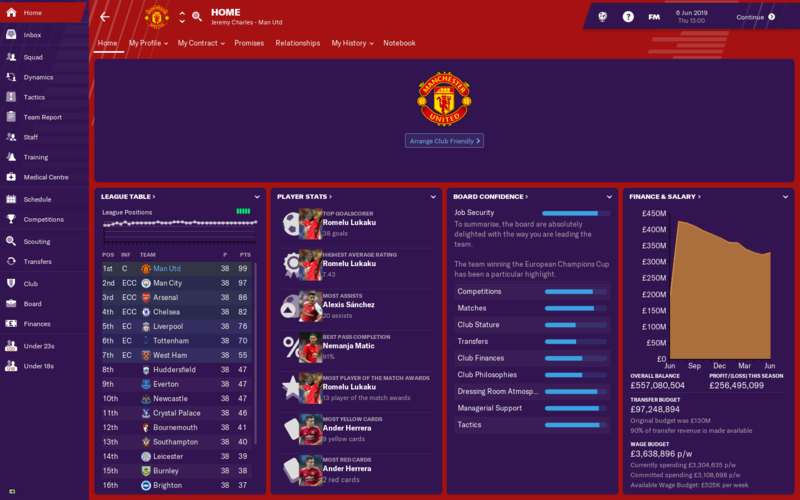 Rojo would probably be my preference but his wages may be a problem hopefully I can get him on low enough % if I include an optional buy as part of the deal. If you need info on other United players, in the OP I had screenshots of everyone and also noted if they were injury prone or had a competitive streak. Slightly confused. In first season and bidding on De Ligt. 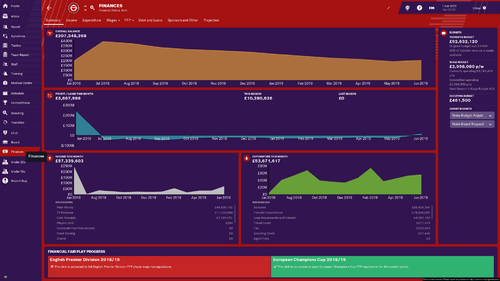 Ajax turned down 35m plus 10m instalments and 50% profit on future sale. Accepted a bit of 25m plus 13m instalments from Chelsea tho. 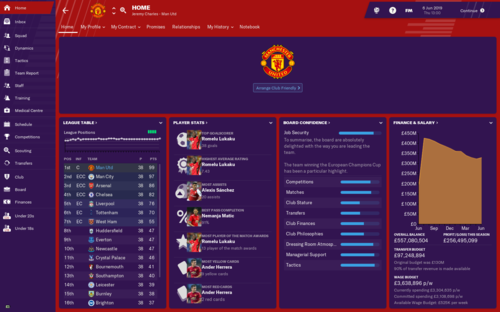 Is there actually Man Utd tax coded into the game? No, just the game has issues of AI buying players for cheap price compared to the user who buys players. Also it depends on what the player thinks too, such as the interest of whomever is after them and his preference to choose another of you. I got the same handed to me and had to bid 50 mill while I only had 35 left as I bought other players first. 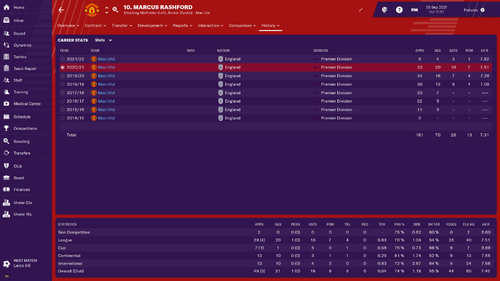 Yes I play Rashford as an Advanced Forward and have also trained him to play as a pressing forward. Here is how he has done for me, with the 3rd season, being his best season. 1st 2 seasons he was rotated with Lukaku, and sometimes played on the left, where as the 3rd season he was my main striker. Trying to replace De Gea, he wouldn't sign a new contract and went to PSG for £77m in January of the second season. 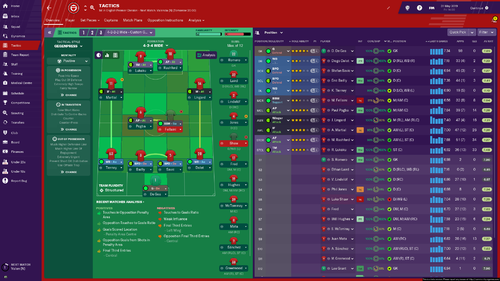 Currently putting up with rotating Rajkovic and Dean Henderson (in my head the whole Utd way, home grown from the club, class of 92 thing Man Utd fans do) playing Henderson seems right in my head. Considering i'm 14 points top of the league in January. Any experience with this player? Media said Next Nemanja Vidic. No, simply cause that price can make you win the league and ucl, waste of money. Look at unai simon, or meret/lafont. I would say no, you could probably get Oblak for less. Thanks, the problem is Atlético wouldn't listen to any offer other than his release clause, which is like £142m I can't quite remember but it's a lot. And I don't want to spend that much on a 27 year old, I know he's a goalkeeper but it's still a lot. 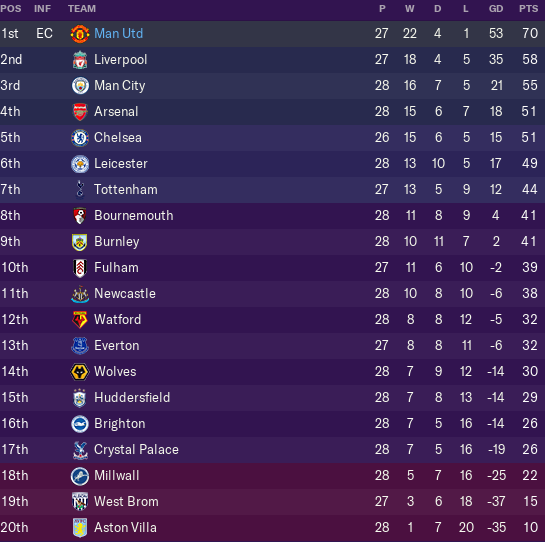 Thanks, I decided to stick it out and keep the faith in Henderson and Rajkovic, neither of them will ever really be good enough, it's unlikely to cost me the league this year but it might cost me the chance to win the Champions League. I've already seen that we're conceding more than when we had De Gea. Luckily I've got £200m sitting around in the budget so I'll see what I can do. @Jamesbfc1887 have you checked out Alban Lafont? Effectively the French version of Donnarumma - started for Toulouse in Ligue 1 aged 16, made 98 apps for them and moved to Fiorentina by age 19. They tend not to do well so he'll probably not be anything like as expensive as Donnarumma but potentially just as good (Although more of an SK than Donnarumma, from memory). I'm playing a 4-3-3DM Wide or as the game see it as 4-1-4-1 been using him in a deep lyind forward attack his attributes suggest should do well after a while but no goals in 17 and coming to the turn of the year. Also tried him in his apparent natural but doesn't do any different. Only found a Pressing Forward effective with a AMC behind the striker. Guessing you are using him in a 4-2-3-1 maybe? Might start again and try and get him firing as wanted him to take Lukaku's place when an offer came in that will be of acceptance. Hopefully he'll be a lot cheaper than Donnarumma, the Yorkshireman in me finds it very difficult to part with my money. 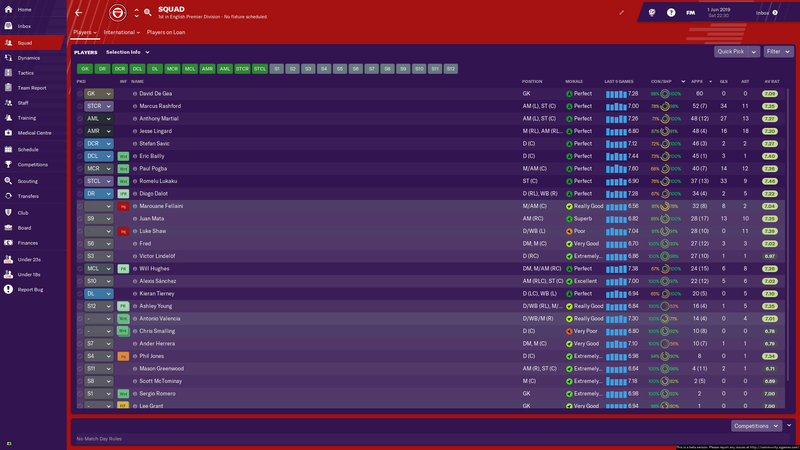 Well I got him after the 1st season on something like £250k/month loan for two years then £40m. 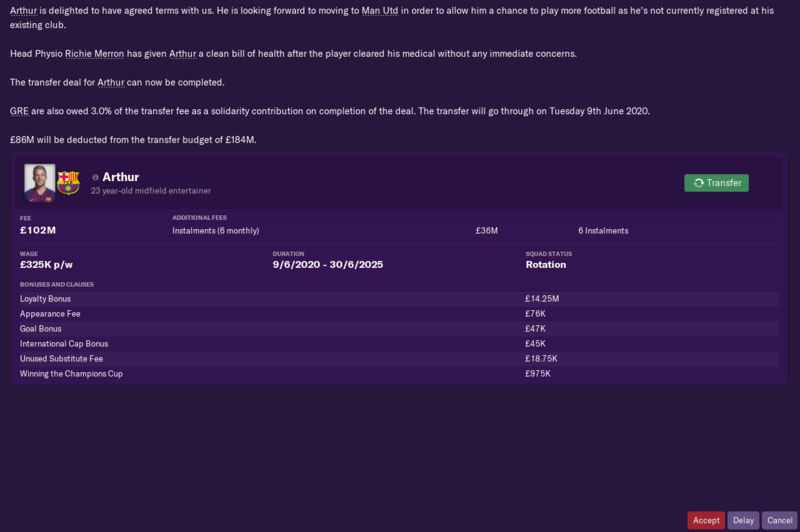 Given his value was quite low due to Fiorentina's relatively weak financial situation (compared to a Dortmund or United) it looked at first glance like overpaying but I reckon he would have been worth more than what he'd cost once he signed, had I played that far. but potentially just as good. That's a really debatable point... If I elaborate I'm afraid I could be over-stepping though as it might be inappropriate info. for this forum. If it was me I'd heavily scout both, multiple times, with scouts with judging potential of 20.
from the list I occasionally consult, he's the closest. Has Donnarumma 170+, Lafont 160-9. That's what you're talking about, right? Donnarumma's default PA is 160-190. So worst case scenario for Lafont but nonetheless feasible, there could be a massive '40 pt' swing to Donnarumma. But there could even be a notable '20 pt' swing to Lafont. Or anything in between. 190 is really elite level, there's barely a handful of players with that type of potential PA. These players deserve an extra level of consideration IMO although I can appreciate the financial aspects and these arguments which I don't necessarily disagree with. Scout reports and gaining as much info. as possible is the way to go though regardless for such a potentially big decision. I'd want to know what several of the top scouts think in terms of the potentials of several top goal-keeping prospects, in particular. A handy tip would be look how far their contract is. If it's around 3years left OR LOWER then you can unsettle them and make them want to come to you which in hindsight reduces their asking price. Did this to players like bentacur, andre silva, chiesa and all worked a treat. Did it to varane too which seems weird cause i got him for 52m when people bought him for 60 when they first started lol. Oh yeah I wasn't advising to just go out and bid without looking. I was just saying that he was someone the guy should consider. Donnarumma is complaining in public that he wanted to join, I've done it with Kimmich and he's pretty annoyed as well. 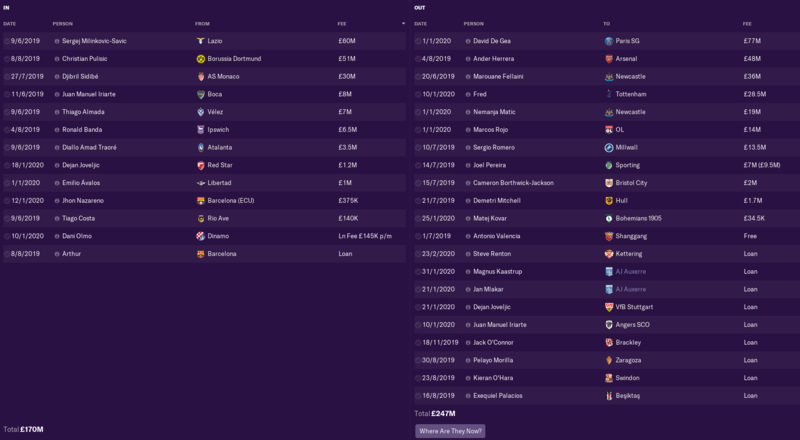 Fiorentina want £61m (release clause) for Lafont, Oblak £126m I'm not paying that! 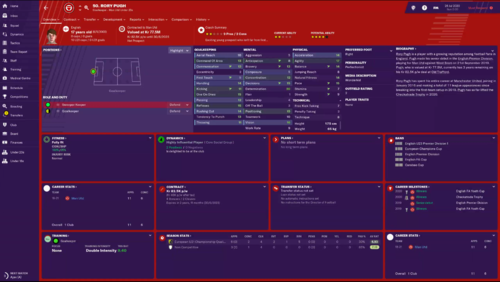 Also how do you normally go about unsettling players, declare interest? or a cheeky bid? 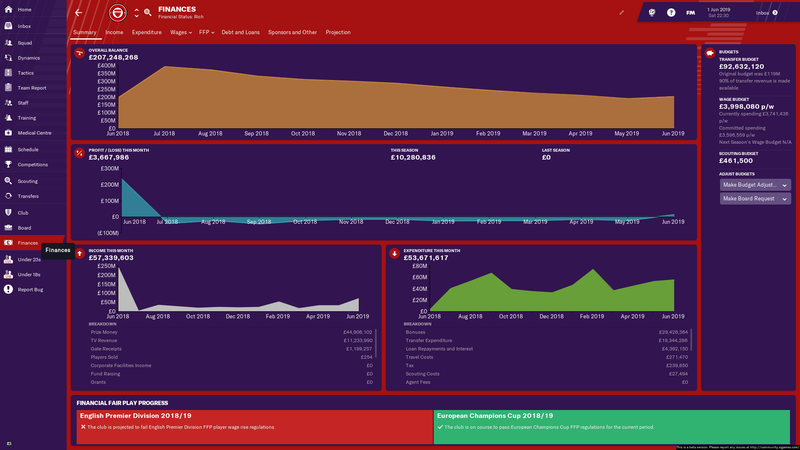 I normally declare interest, set my DoF to scout for 3 matches, if I have one of the target's favoured personnel on staff I get them to talk to the press, otherwise I use the highest rep / my captain, then I make a bid (making sure to lock no more than 10% profit on next sale, just in case they're reasonable). If that doesn't work, I make an enquiry every time my DoF comes back with a match report, then when they're still being unreasonable I start submitting non-negotiable bids varying between ones with no clauses and ones made mostly of clauses until I've worn them into submission. 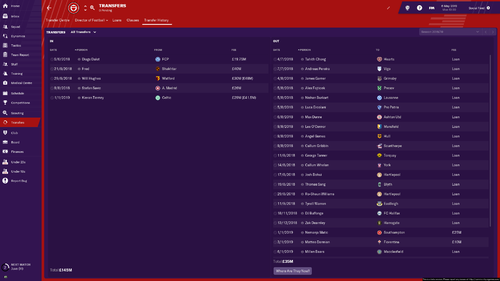 If it goes on longer than a month I get another player to talk to the press too, and I keep sending my DoF or AM to scout them in person - I might even scout them myself. If you have to go to those lengths though, don't expect to ever get an easy ride purchasing from that manager again. 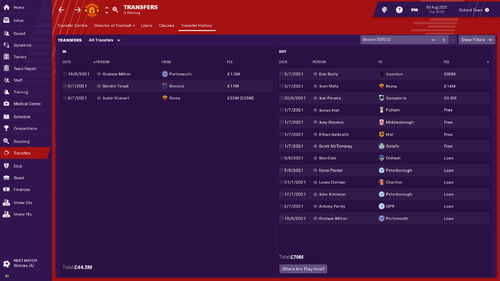 I did it with Christian Pulisic on FM18, and Bosz then proposed outrageous prices for anyone else I asked about, before selling them for about half that to rival PL teams. Sorry to bother you lot again with my transfer questions but when it comes to spending the big bucks I always tend to struggle to find the right players. I managed to get Arthur on loan at the start of the 2nd season and he's been fantastic, rotating in and out in a midfield 2 with Milinkovic-Savic and Pogba. I'm currently using him as DLP (s) or a BBM. I'm probably going to lose Pogba in the summer he wants to leave for Real Madrid and he has 18 months left on his contract. But once again I feel like I'm massively overpaying for a player. Any alternatives? Obviously there's players like Verratti or Saul but I'm a bit stuck. So should I sign him? Saul's release clause is £90m so that's about the going rate, £102m probably isn't overpaying for Arthur tbh. I think the lowest I've seen Barca loan him out with an option is £92m. That's a good sign, how long does he have on his contract? Although now that you've put a bid and negotiated a contract it'll be either sign him or don't sign him that season. Maybe get as close as 61m so try around 55m and touble tap the white lock till it goes orange (semi-negotiable) and suggest terms, if they move it to 61 move it to 58, if it happens again go for 60 if you want to be picky. Both, declare interest, see how they bold well with you "watching them/scouting" then put a cheeky bid that's reasonable in reality so realistically i'd bid 60/70 for oblak, 40-45 on lafont and if they're interested in moving then they request a transfer. However, you have to keep putting dirty bids in before the transfer window be that it's in june or pressuring towards start of december for an easy jan transfer. Thanks, think that's the best bargain i've got that's close to the start of the game in all editions of FM lol. Do you let your DoF handle negotiations? that contract is bloody huge that even pogba wouldn't get lol, this DoF of yours will rinse that 180m you have towards that wage and maybe even the FFP fine you/deduct points cause a huge inc in your wage bill. I don't want to force you to do my style but the AI for DoF's aren't as good as the user. 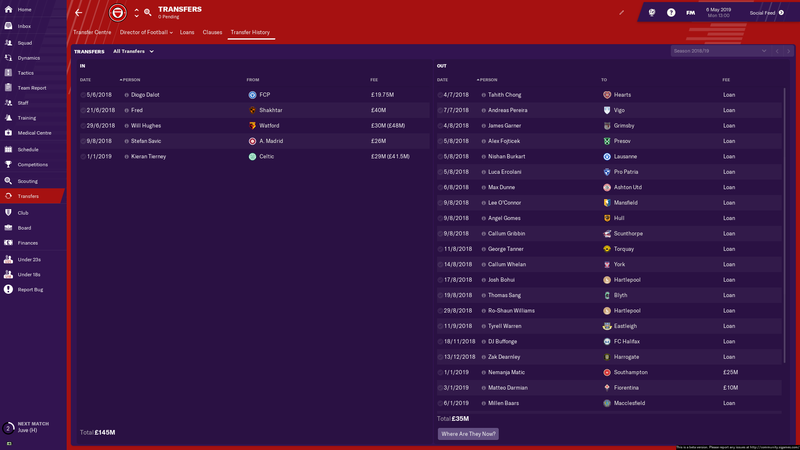 Look at Houssem Aouar (Closest thing to pogba in terms of creating and physical dominance- OP- check a few lyon Cm's they could fit you bill, hes about 80mill which is miles better than the cost you're getting for arthur), lucas paqueta, joao felix (dubbed next big thing and fairly cheap), Ryan Gravenberch, Mickaël Cuisance. Let me know how you get on, scout and wait i'd say until you're dead set on him or one that I showed you or one you have scouted yourself. 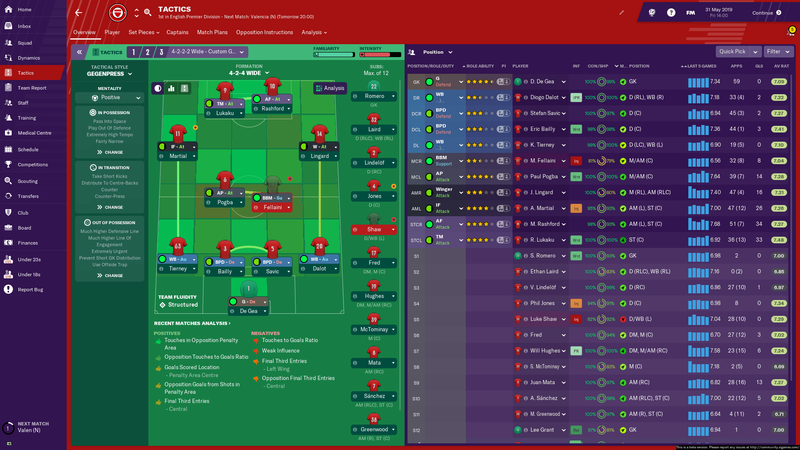 This is the formation I have been using for the last 2 seasons. 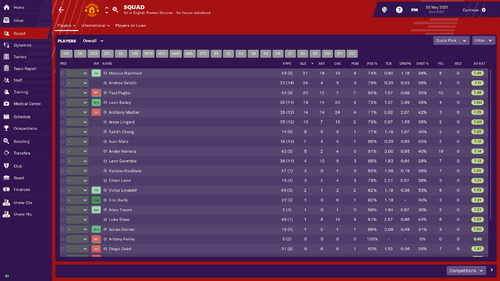 So after a clean sweep in season 3, winning all 4 trophies our transfer business for season 4 was fairly simple. Tonali and Kluivert in, both still young, and Tonali was a lot cheaper than expected which is always nice. Bailly wanted to leave and Mata is getting on abit so both were moved on. 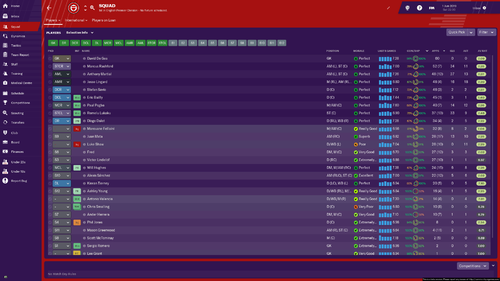 Farley and Pardal are 2 very promising regens, who will spend the season out on loan before coming into the 1st team. Here is my best 11 going into season 4. Semedo and Dalot are rotated quite often, with both doing well. 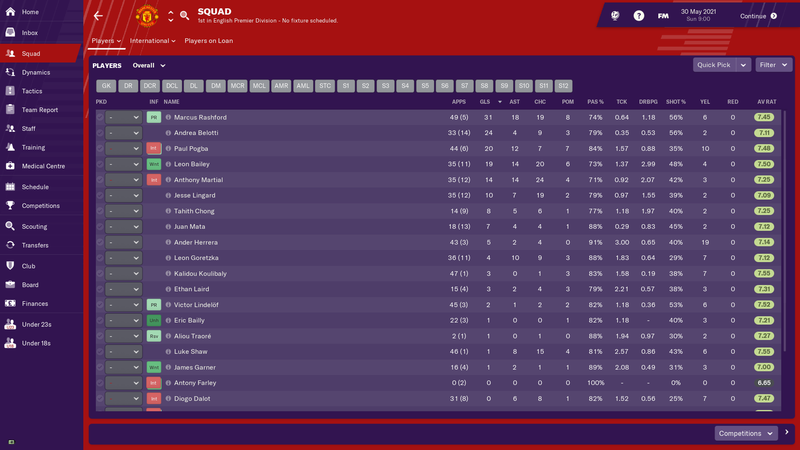 Laird and Chong have been my best youngsters so far in this save so their development will continue, along with Gomes and greenwood coming in after 2 seasons out on loan. I have decided if I win the league title this season, it will make it 3 titles in a row and 3 in 4 seasons, so I will then sell quite a few of the 1st team and use the youngsters and give them a season and see how get on with them. But lets see how season 4 goes, we have had a great start only losing 1 game in all comps so far. How you keep doing this beyond me lol. Surely your defensive side will be targeted cause last I heard goretzka was quite attacking. You tried using a DLP support to maybe help instead of box to box? Wow surprising was a 4-1-4-1. 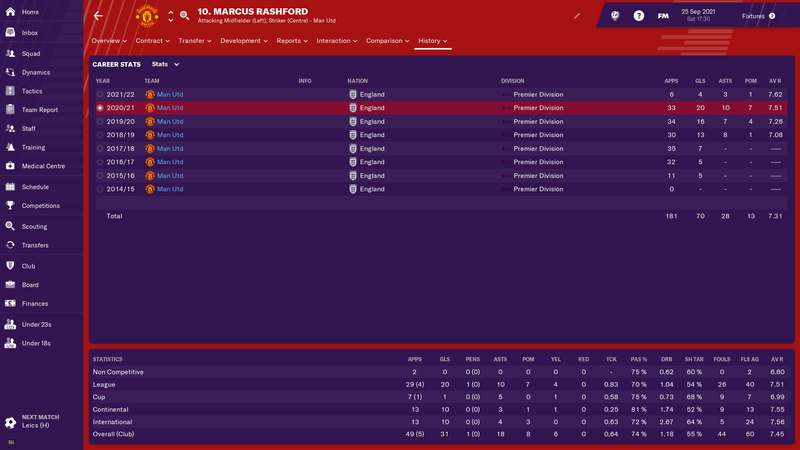 How did Rashford do as a Pressing Forward? Did you make a personal instructions for him like I see you have which if you could share that so I can see if I can resurrect his season. Hows Pogba been for you in Mezzela - Attack what sort of personal instructions you use for him would like him to hit double figures but consistently inconsistent. 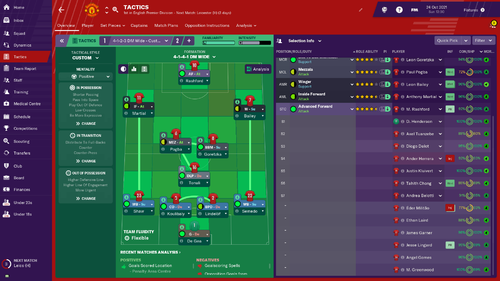 Maybe I need to change a role of mine to a winger that would create chances for the strikers, instead of two Inside Forwards that I've currently got. Tonali I've got coming in January which is a few days away. 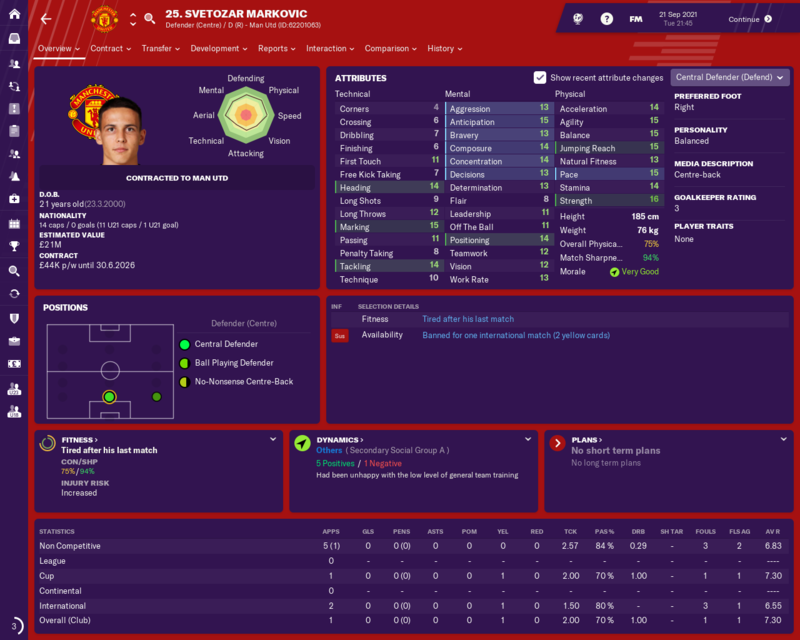 Do you use Chong as winger or Inside Forward? He did ok as a pressing forward but works better as the advanced forward. I hadn't added any personal instructions, until this season and I have now added dribble more often and roam from position. Pogba has been good in that role, doesn't get a great deal of assists, but scores quite a few goals, but again haven't added any personal instructions. I use Chong as an inside forward, his crossing stat isn't amazing so doesn't really suit the winger role. How I keep doing what? haha. He is fairly attacking but does a great job as a box to box, has a decent tackles per game ratio, plus a good passing completion. We keep a lot of clean sheets and don't generally concede many chances, apart from the odd few games. I already have a DLP so wouldn't want to play with 2, the 3 roles I use seem to work for me. @BigV Lafont is under contract until 2024 and Donnarumma until 2024. Lafont wants to impress with his next performance now I've declared interest, which is good. A bit calmer, some big earners left as well. I'm presuming all is in good order here. All whilst being top of the league! Lyon want £104m for Aouar with 3 years left on his deal. 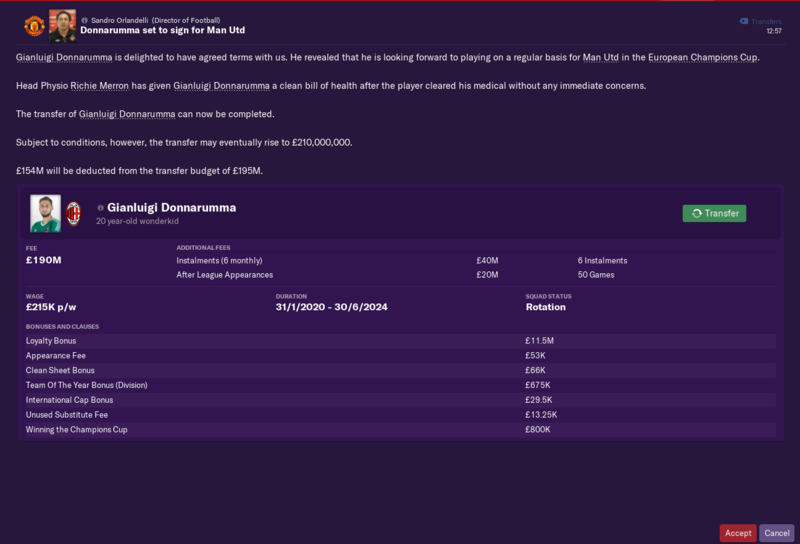 £107m for Paqueta who's at Inter now until 2024. Joao Felix at Arsenal so that ain't happening. Gravenbach Ajax want £11m that could be good but he's definitely one for the future, which I'm more than ok with. I'm also looking at Asensio seems like I could get for about £50-60m which seems like a steal tbh. I'm scouting all your suggestions so fingers crossed, big thanks though for your help so far, keep the wisdom coming . 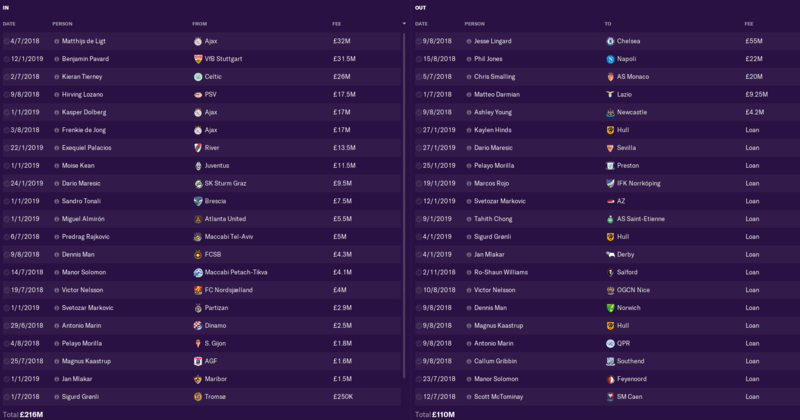 Wowzers those are some transfers lol, my first thought when I saw your massive deals was that you were kinda new or getting to grips but holy moly you made some sweet deals in that transfer market. I'd go for asensio lol, i'd also look at isco but his teamwork is a bit of a drag. Literally all those that i mentioned were my back ups for pogba ahaha, I'll check now on my save i had a huge list. Look at Alex meret for GK, he's ishy for some stats but his potential is pretty damn high. Pau lopez is another i had saved. Really hope you get lafont simply cause he's the closest to the next best GK in terms of real players. Cms- Kai Havertz (potentially change to cm), Mickael Cuisance, Arne Maier, marco benasi, marcelo brozovic (probably a lower end pogba), have a look at kondogbia similar but less creative and more box to box but certainly could move milenkovic to a playmaker role. frenkie de jong, maxime lopez. @BigV Thinking about it I could start rotating Tonali in, he would give us something a bit different for sure. lol De Jong one step ahead of you, I've already got him in but he didn't impress much last season (6 tackling doesn't help) me and Barça did a kind of weird little loan swap De Jong for Arthur, but I could give him a second chance however if I lost Pogba I'd need the type of player you've suggested. I was looking at Marko Rog at Napoli looks like a decent affordable box to box who could play second fiddle to Milinkovic. I'll check your other suggestions out too, Havertz intrigues me he would be incredible if I could get him to master the cm role.